Texas (www.scidev.net/asia) – Five women scientists from the developing world have been awarded an international prize for research that promotes socio-economic development and a better quality of life. Hasibun Naher from Bangladesh, Germaine Djuidje Kenmoe from Cameroon, Silvia González Pérez from Ecuador, Dawn Iona Fox from Guyana and Witri Wahyu Lestari from Indonesia each received a US$5,000 cash prize for their work. 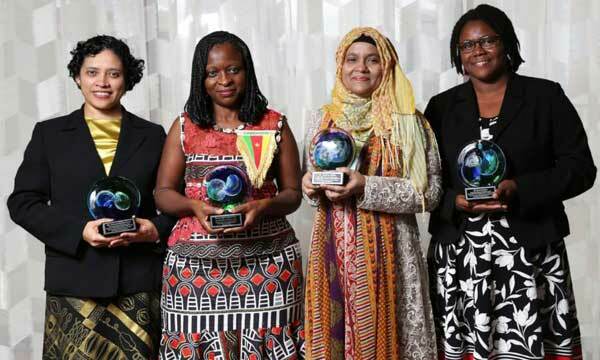 “To become a scientist in a developing country, a woman must be creative and committed”, Djuidje Kenmoe, the Cameroonian OWSD-Elsevier prize winner, told SciDev.Net. This, she added, is because in addition to academic work, she will often be “tied to social and familiar responsibilities and duties”. According to Moreno, this prize highlights the need to promote women scientists’ presence in scientific fields they may have been prevented from entering — both in formal ways, for example through restrictions on studying or entering into academic life, and in symbolic ways, through “myths, stereotypes and narratives that feed the false notion that women do not have an aptitude for science”. According to Moreno, prizes also represent the interests of the organisations that grant them. They can “legitimize economic power”, but also have value as “they allow even a minimal distribution of wealth”. The Elsevier Foundation has faced strong criticism from the scientific communities in several European countries, who pay large sums to publish and access articles in journals owned by Elsevier. At the end of last year, 200 German academic institutions cancelled their subscriptions to the publishing house in a push for national negotiation that offers fairer payments for their publications and open access for the institutions that produce them.